Todays's corporate web sites must support thousands of users, mulitple operating environments and a complicated mix of applications. It is crucial to your business to know how well you web application performs under heavy user load. Are there any parts of your system that do not work correctly when multiple users try to access them concurrently? What affect does one use-case of your system have on others when it is refactored? What kind of hardware is required to support the scalability that meets your non-functional requirements? To answer all these questions you need to conduct automated load testing before, during and after application deployment. You need StressIT. 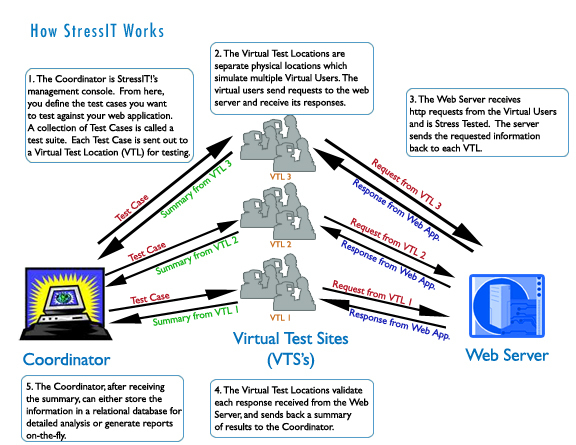 StressIT is a robust stress testing application that accurately simulates the number of users your site can maintain. It will allow you to chart the breaking point at which your site's performance is no longer acceptable, and will allow you to pinpoint the bottlenecks preventing your site from reaching its maximum performance levels. StressIT allows you to define relevant use-case scenarios for your website; this customization allows you to test all aspects of your complex multi-tiered web-based application. Using StressIT you can test any web based application that is capable of dynamically generating data. StressIT works independently of the programing language, operating system or technology that you used on the web server. Therefore, any web application using technologies such as J2EE, Dot-Net, PHP, and Perl can be tested with StressIT. You need to test answer questions related to your non-functional requirement during and after development is over. How do different parts of your application behave when modifications are made to an important component. What is the health of our web and application server under heavy load.